GET THE STINK OUT ! The Stink Genie is a DIY multi-purpose deodorizing/sanitizing unit that is a uniquely engineered, integrated UVC (ozone) system designed to dramatically reduce and control toxic compounds such as mold, mildew, fungus, formaldehyde, xylene gasses and all types of smoke along with infectious agents such as bacteria, influenza, hemolytic streptococci and many others. The Stink Genie removes the source cause of odors, instead of just masking them like sprays and deodorizers. The Stink Genie can be used in small enclosed spaces to generate the ozone shock treatment. Place unit in top or middle of any bag, bin, drum or any space enclosure and items within the space will be treated. For larger areas, a longer treatment time will be required. BUILT to Outlast Your Sports Equipment ! NORTH AMERICAN manufactured with all UL components. DON’T just mask odors with sprays ! NO chemical spray residue ! START Eliminating Odor and Bacteria Now ! BEST in market–16,000 (1hr) shock treatment bulb life. Ozone is NOT a spray! Ozone is a gas. Gases can penetrate any porous object. Because ozone is highly reactive, it readily oxidizes (breaks down) organic matter. When the ozone encounters another compound, one oxygen atom will break away, attach itself to the compound, and oxidize it. Ozone actually breaks down odor-causing compounds, thereby eliminating the odor and changing the ozone back to oxygen (O2). Ozone is one of the most powerful sterilant in the world and its function is to destroy bacteria, viral and odors. Ozone occurs quite readily in nature most often as a result of lightning strikes that occur during thunderstorms. In fact that “fresh, clean, spring rain” smell that we notice after a storm results from nature’s creation of ozone. Ozone kills bacteria by rupturing the cell wall of the offending organism. This action kills the bacteria leaving only harmless waste. After an ozone treatment, the bacteria is destroyed, not left dormant to resurrect the odors. Ozone is used to clean your drinking water, to clean your pools, to clean the air, and to kill harmful bacteria and pathogens in a variety of processes, including emergency rooms, hotels, theatres, day cares, nursing homes, office buildings, restoration companies and more! Bacteria, viruses and other pathogens thrive around us and in our sports equipment. Because the membranes which protect these microbes are constructed with carbon-chain molecules, they are a prime target for the free-radicals produced from ozone. Ozone attacks the microorganisms and their membranes and is virtually instant. Ozone annihilates bacteria and viruses 3,000 times faster than chlorine, to many considered a strong disinfectant. Since we know that it is the bacteria that is causing the odors in your equipment, ozone is perfect for this deodorizing process. The Stink Genie system easily inserts into any equipment bag. Remove items that can be machine washed (if possible but not necessary) and place system in the middle of the bag not to restrict airflow. Turn on, walk away and come back in 30 minutes to shut off the unit. Ozone will dissipate back to oxygen and leave gear with a fresh smell. Time may vary depending on equipment odors. The Stink Genie can be used for pet odor removal to sanitize the entire area living area while the pets are away. Ozone works great in homes, offices, clinics and other facilities as a dog and cat urine odor remover, as well as general pet odors clinging to bedding, carpet, walls or ceilings. Any items can be placed in a bag or bin and place unit inside and leave for treatment. 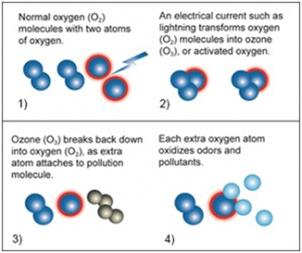 Ozone will go wherever air flows to oxidize odors at their source. From a room to an entire facility that needs cat and dog urine odor removal, The Stink Genie generator is a powerful deodorizer. The Stink Genie can be used in any vehicles that contain smoke or other foul odors. Place the unit on the dashboard or anywhere higher up in the vehicle. Ozone is heavier than air so the higher the point the better. Don’ t mask odors with artificial air fresheners that some find offensive. Create a fresh smelling, car, truck, RV or tour bus free of odors with The Stink Genie. The Stink Genie for Schools, classrooms and office buildings that develop odors as a result of being used for extended periods by a variety of occupants. In addition, school locker rooms and gymnasiums are notorious for developing odors that are not easy to eliminate. For the most comprehensive microorganism and odor removal, choose The Stink Genie system. With ozone odor removal, the next occupant enters an office or classroom and there is no trace of an odor from previous inhabitants. The Stink Genie is extremely effective for smoke odor removal because the O3 attacks odors at their source, even if they are clinging to walls, fabrics and ductwork. The best way to remove cigarette odor from smoking bars, bingo parlors, pubs, casinos and pool halls is at night while the facility is closed. Buildings that have suffered fire and smoke damage may require a longer-term ozone shock treatment with The Stink Genie, but ozone is very effective in fire damage and tobacco smoke odor removal. The Stink Genie can help a residence with an odor problem that can hinder the sale or rental of an otherwise beautiful home. Ozone generators are extremely effective at removing odors that cling to walls, carpet, furniture, drapes, and inside ductwork as well as in the bathroom, kitchen and closets. Remove cigarette odor, body odors, pet odors or almost any odor before renting homes, apartments, dormitories or hotel rooms to new occupants. Kill odors inside the entire residence with The Stink Genie. The Stink Genie can help with moisture inside marine vessels that creates a potential breeding ground for microorganisms and the development of odors in many spaces. Thoroughly remove odors from cruise ship cabins and dining rooms with The Stink Genie system. The Stink Genie helps when water floods all or part of a facility, mold and mildew are almost inevitable. In water damaged areas or damp environments, O3 will deteriorate the cell structure of microorganisms, mold and mildew, and break down their ability to reproduce.